Go North East has 90 positions to fill within driver and engineering roles. With training via its in-house Academy, 72 driver positions are on offer, with no previous bus driving experience necessary. 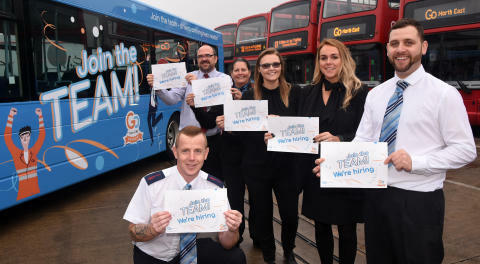 Go North East, which is the third largest private employer in the region, is also seeking 18 mechanical engineers who can help get its fleet of 650 buses safely out on the road each day. Boasting excellent employee benefits and career development opportunities, Go North East is renowned for its long-standing and committed workforce. Paying tribute to its team at an annual long service awards, it commemorates the achievements of colleagues celebrating 20+ years, all the way through to 50 years, with the company. Keith Robertson, recruitment and training manager at Go North East, is hoping anyone who might like to try their hand at driving a bus or fancies a career switch to bus mechanics, will pop along to the company’s forthcoming recruitment open day. “From 10am-2pm on Sunday 21st October we’re hosting an open day at the Stadium of Light in Sunderland. We’ll be taking over the yellow carpark and will have some buses on site, for any inspiring drivers to have a go behind the wheel,” Keith explained.